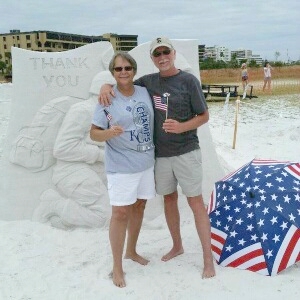 When we travel over 1,000 miles to enjoy a beachfront vacation we’re not interested in being steps from the beach, across from the beach, or having what is euphemistically advertised as, “a view of the beach.” We want to be on the beach, and as close to the water as possible. In our opinion, it simply makes no sense to stop 1,000 or even 500 feet short of our destination. 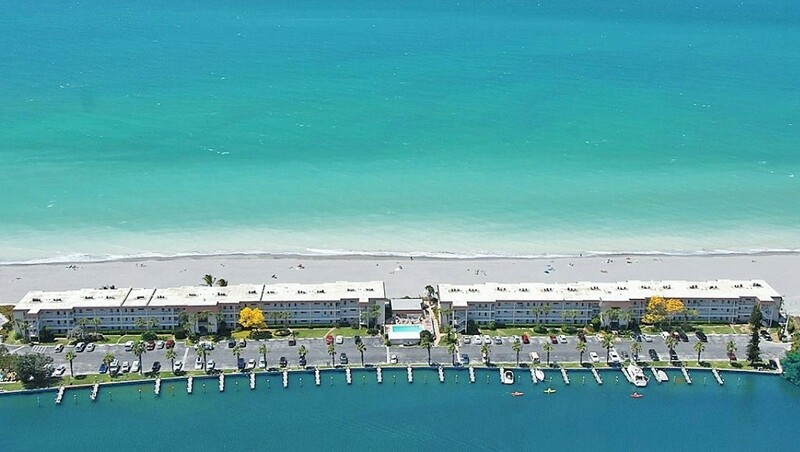 This is why we chose the closest oceanfront condo to the Gulf of Mexico on Siesta Key. With its wide-open floor plan, you will enjoy direct Gulf views from the lanai, master bedroom, living room, dining room and even the kitchen. This is beachfront at its best! Our guests are welcome use the boat docks, Kayak storage, Kayak launch and the gas BBQ grills that line the seawall free of charge. After buying our condo the first priority was perfecting the 120 square foot lanai. At the risk of sounding gauche, we spared no expense when we decided to rip out the old and start fresh with 13 feet of floor to ceiling sliding glass panels across the western view of the Gulf and a large vertical picture window on the southern wall that provides a clear view of the expansive beach to the south. To insure there would be nothing to interfere with our direct view of the beach and Gulf, we replaced the “picket fence” railing with a custom tempered glass rail. 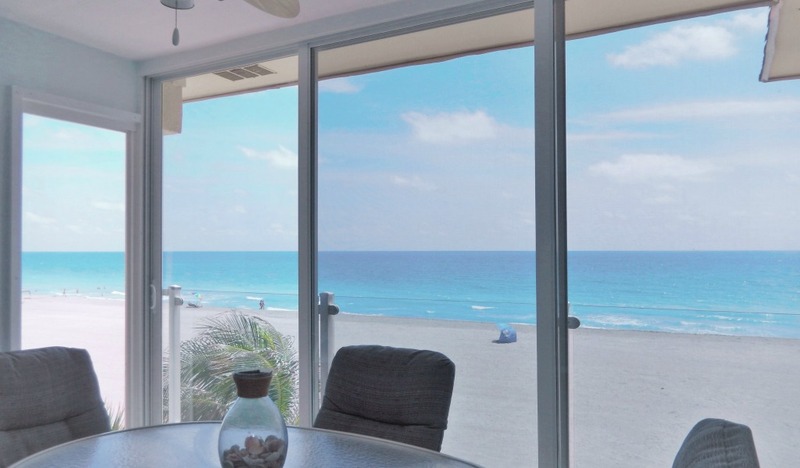 This eliminated the “living behind bars” feeling of the picket fence and provides a totally unobstructed view of the beach and the Gulf of Mexico. The lanai screens slide too, which allows you to take amazing sunset pictures from the comfort of your front row seat. Most of the other units in our complex have a fixed lanai screen that cannot be moved for taking pictures. 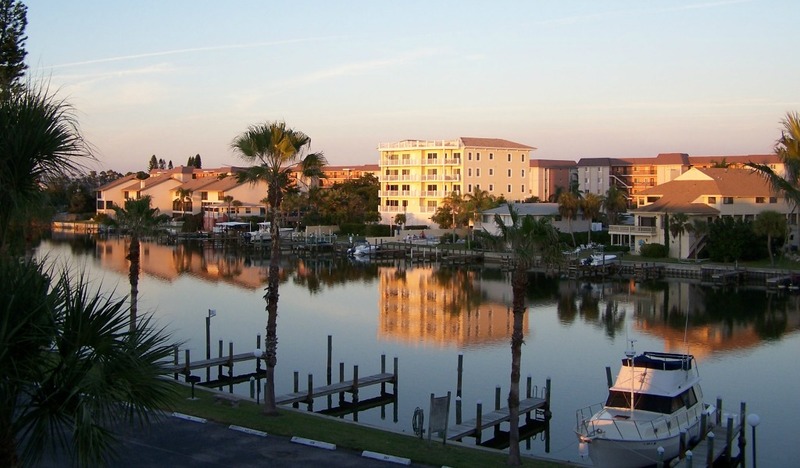 We love sitting on the lanai in the morning enjoying our coffee with the gentle Gulf breeze as we make plans for the day, and then returning later to savor the sunset. 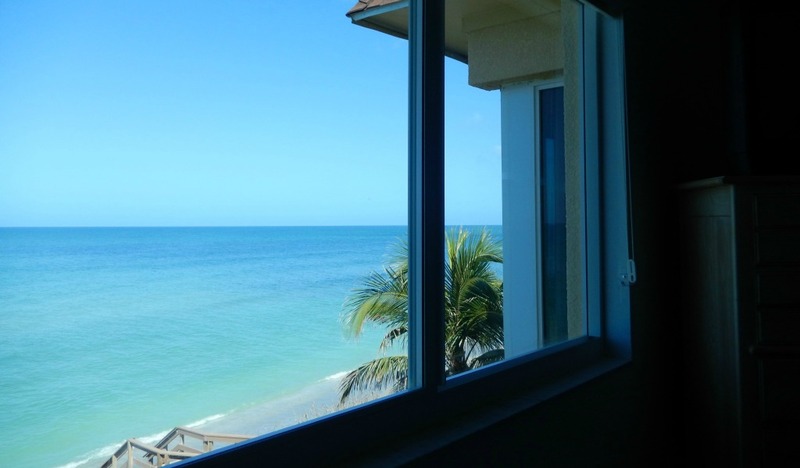 The view from the Master Suite, which has a 4 x 6 foot sliding window directly facing the beach and Gulf, is equally amazing. The picture above was taken from laying on the Master Suite bed. Can you think of a better way to start your day than waking up to this view? 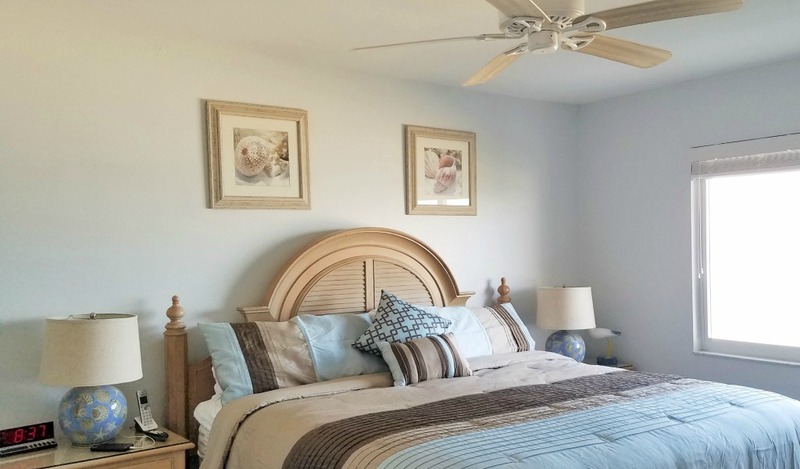 The condo floor plan is spacious with large bedrooms that easily accommodate the king-size Jamison pillow-top beds you will find in the oceanfront master suite and and bay-front east bedroom. These beds are two notches up from the beds Jamison sells to the Marriott. Both bedrooms also have plenty of closest space. There are two freshly updated full bathrooms – one with a large tiled shower in the master suite, and the other with a tub and shower. The large east bedroom is equipped with HDTV and a DVD player. With its sliding 3 x 6 foot window, it provides a sunrise view overlooking the bay inlet where you will often see Manatees and their calves in the afternoon. The east wing of the condo can be closed off to provide private access to the adjoining full bath. 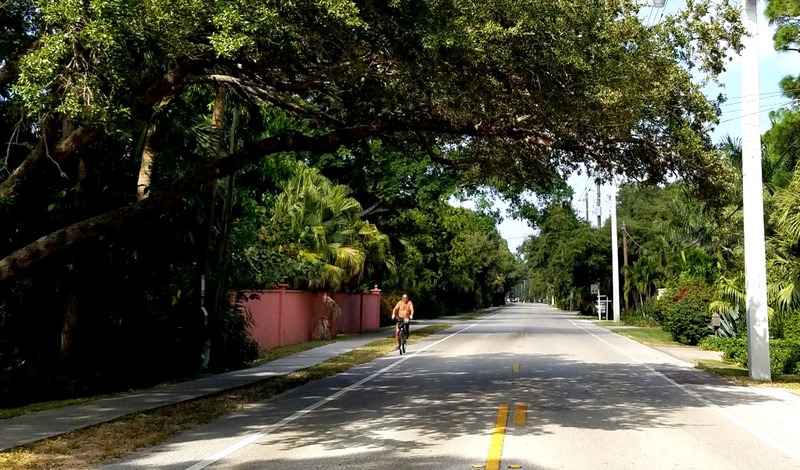 The traffic moves smoothly along the tree-shaded road to our condo. It has wide bicycle lanes on both sides and a sidewalk on one side..
For your convenience, your reserved parking space is straight across from the entrance where you will find an elevator and carts that you can use to move things between your vehicle and your room. If you have any questions or would like to make a reservation, please feel welcome to Contact Us at your convenience.